This entry was posted in Everything Else and tagged Amare Stoudamire, boston sports blog, Carmelo Anthony, Jeremy Lin, Linning, Linsanity, New York Knicks, tim tebow by nolankartholl. Bookmark the permalink. I hate that Lin’s being associated with Tebow because there’s only one similarity between the two. And that’s the media sensation. People love to see them win. 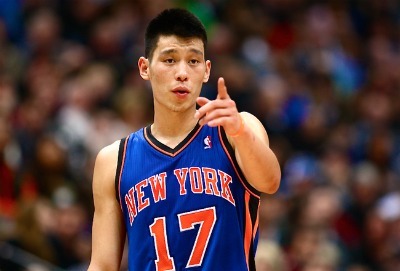 I mean I hate the Knicks but then again I hate myself for enjoying watching Lin win games even if it is the Knicks. Regardless, Tebow was a big name in college. Everyone knew his style and the fact that his transition to pro ball was always in question because of his mechanics. Lin on the other hand came out of no where. He was just days away from being cut by another team and now look at him. He’s played his balls off the first 6 games of his NBA career, beating out Kobe while dropping 38 points and last night taking the game into his hands and hitting a game winner with .5 on the clock. Lin should not be associated with Tebow in terms of skill in a professional sports league. Lin’s ability to run the point, drive to the hole, and shoot the long ball makes him just as much a threat as anyone on the court. It’ll be interesting to see if he can keep it up moving forward. If so, Lin could very well be considered a premier player in the NBA as opposed to a media sensation.